This sample price: priced within the past 7 days for arrival on Wednesday, September 11, 2019, departure from Washington (all Airports), DC. Choose your own departure city and dates. Arenal Volcano is located in north-western Costa Rica, around 55 miles of San José, in the province of Alajuela and it's a must-do while in Costa Rica. It is one of the most active volcanoes in the country and in the world. Arenal’s perfectly symmetrical shape makes it a sightseer’s dream with abundance of outdoor activities. Must See's: Lake Arenal, Arenal Natura Ecological Park, Hanging Bridges, Hot Springs, Lava Trail, Danta River and Waterfall, Chocolate Farm. Monteverde Cloud Forest is one of the most extraordinary and important nature reserves in the world. With thousands of species of animals, birds, and plants, including over 300 types of orchids alone, this fantasy land for nature lovers covers more than 26,000 acres that support a massive diversity of plant and animal life and an inexhaustible variety of outdoor activities. Must See's: Monteverde Cloud Forest Reserve, Selvatura Park, Curi Cancha Wildlife Refuge, Butterfly Gardens, Orchid Garden. Guanacaste is located along Costa Rica`s northwestern Pacific coastline and it boasts over 100 miles of exquisite beaches. It is a land of privileged landscapes, sunny weather, a variety of ecosystems and home to a significant portion of the environmental and cultural heritage of Costa Rica. Must See's: Coco Beach, Samara Beach, Papagayo Peninsula, Palo Verde National Park, Tempisque River, Rincon de la Vieja National Park, Tamarindo Beach. 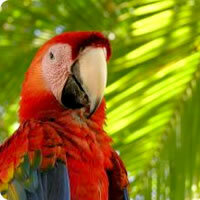 Costa Rica is a country of blazing volcanoes, dense rainforests, and glistening beaches. The staggering array of landscapes, unique microclimates, and wide range of elevations have produced one of earth's richest plant and wildlife habitats, and made Costa Rica an epicenter of eco-tourism, as well as the most popular and alluring destination in Central America. Perfect for nature enthusiasts, surfers, sun worshipers, and adventure seekers of all types, Costa Rica's slogan "Pura Vida" (pure life) says is all.